The only reason I can think of, as to why I’m posting the Clientele’s ‘Bookshop Casanova’, is simply based on the fact that it was included by Pitchfork in their top 100 tracks of 2007. It’s also the only reason why I could never force myself to delete it from my computer. The track’s good, but is it great? I figured I haven’t reached that level quite yet. The Clientele have begun making music since way back, and by way back, I specifically mean 1991. 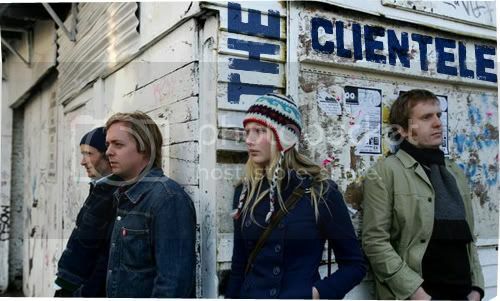 I never had the chance to listen to their previous albums, such as one of the more impressive records of 2005, Strange Geometry or their collected songs in Suburban Lights, thus making 2007's, God Save the Clientele, the first I’ve actually heard of them. So, if we’re talking about left out, this is major left-outism-- I have no doubt in that. And from what I’ve also heard so far, this is definitely one band to catch up on the music. ‘Bookshop Casanova’ takes on a somewhat sketchy 70’s pop sound, as it creates a dreamy atmosphere while venturing into psychedelic realms. The tune is drenched in reverb, adjoined by distinctive, breathy vocals, as what is most known in the music of the Clientele, alongside staccato guitar chords and sweeping strings of the violin-- wait a minute, is it the violin?